If you scan a lot of documents and books you know how much time you can lose to transfer the scanned contents onto your computer and convert the files to the format you need. ScanPapyrus is an application that can make this job a lot easier and less time consuming. ScanPapyrus can aquire data from your flatbed scanner and save it onto your computer as DOCX, PDF, JPEG, TIFF, BMP or PNG files. It supports various types of scanners and includes a built-in set of image editing tools. Moreover, ScanPapyrus can automate the scanning process by commanding the scanner that’s connected to your machine to start the process automatically at the time intervals of your choice. This way, you can give yourself enough time to flip pages or place a different document in the scanning area. After it aquires the image, ScanPapyrus can automatically improve its quality by performing sharpness adjustments, cropping the image, removing dust, stripes and gray background. The application lets you select the image quality and color, before the document is scanned. 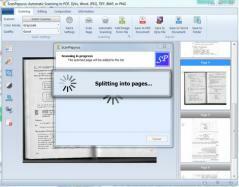 ScanPapyrus can split facing book pages automatically as well as create multi-page documents. In addition to scanner aquired images, you can also load them from local folders and add them as new pages or insert them into the current page. The program makes it easy to organize your scanned documents as well as edit images using the built-in essential dedicated tools and the preview area.